This post is one of two posts about an unfortunate connection. More than a century after the Esterházy family had been patrons to Joseph Haydn‘s (31 March 1732 – 31 May 1809), an Esterházy, but of a different branch than Haydn’s generous patrons, would commit treason against France, but was protected by the French army. He retired in 1898 and escaped punishment by feeing to England. The Haydn I wish to write about is the musician who, after difficult beginnings, came to the attention of aristocrats: Karl Joseph von Fürnberg, the Bohemian count Ferdinand Maximilian von Morzin (1758) and, in particular, the extremely wealthy Esterházy family, the House of Esterházy, a Magyar family at whose court, first in Eisenstadt and, second, at Esterháza (now Fertöd), Haydn would work for nearly thirty years (from 1761 to 1790). He was Vice-Kapellmeister to prince Paul II Anton Esterházy de Galántha (22 April 1711 – 18 March 1762) and, a year later, when prince Anton passed away, he became Hofkapellmeister, or music director, to his brother, prince Nikolaus I or Miklós József Esterházy (d. 1790). Let us look at Haydn’s early life. Haydn was born to a humble family in Rohrau, Austria, a village near the border with Hungary). He was the son of a wheelwright and his wife Maria, née Koller, who had worked as a cook at the palace of Aloys Thomas Raimund, Count Harrach (7 March, 1669, Vienna – 7 November, 1742, an Austrian politician and diplomat. It was not possible for Haydn to develop his talent for music in Rohrau. At the age of six, he was therefore sent to apprentice as a musician at the home of Johann Matthias Frankh, a relative of the Haydn family who lived in Hainburg. As Frankh’s student, Haydn learned to play the harpsichord and the violin. But it was as a singer that he was brought to the attention of Georg von Reutter. At the age of eight, in 1740, Haydn auditioned for Reutter, the director of music at St. Stephen’s Cathedral in Vienna, who convinced Joseph’ family to let him take young Joseph and his brother Michael as choirboys at St. Stephen’s. Haydn was eight years old. However, at the age of seventeen, he was expelled from the choir. His voice had changed and he had played a practical joke on another chorister. Haydn was taken in by Johann Michael Spangler, a musician whose garret he shared, and supported himself with odd musical jobs. Fortunately, he met Nicola Porpora who gave him a position as accompanist for voice lessons and corrected his compositions. As a chorister, Haydn had not acquired sufficient knowledge of the theory of music to become a composer. Matters would change. We have already seen that Haydn first came to the attention of Austrian nobleman Karl Joseph von Fürnberg. He was a member of Fürnberg’s small orchestra and, during his tenure as Fürnberg’s employee, he wrote his first quartets. We also know that, in 1758, he was recommended to Bohemian Count Morzin. (See Ferdinand Maximilian von Morzin, Britannica.) During the three years Haydn was Kapellmeister to count Morzin, his patron put him in charge of an orchestra of about 16 musicians. At this point, Haydn composed his first symphonies. Later, in c. 1761, when Count Morzin dismissed his musicians, a relatively unknown Haydn was hired by prince Paul II Anton Esterházy de Galántha (22 April 1711 – 18 March 1762), a member of the extremely wealthy Esterházy family. He worked first at Eisenstadt, earning a yearly salary of 400 florins and, after Prince Anton or Pál Antal passed away, in 1762, his patron would be Nikolaus Esterházy or Miklós József Esterházy, Pál Antal’s brother, in whose employ he would remain for nearly 30 years and whom he followed when the princely family moved to Esterháza (now Fertöd), their Hungarian palace, built in 1762-1766. Prince Nikolaus I was Haydn’s patron until his death in 1790. His successor dismissed Nikolaus’ court musicians but continued to pay Haydn 400 florins a year, which had been his salary in 1761. Moreover, Count Nikolaus had left Haydn a pension of 1000 florins. As well, given that his services were no longer needed, Haydn’s new patron allowed him to travel, which led to an apotheosis in Haydn’s career. However, he could choose the musicians who would be members of his chamber orchestra. Moreover, he was free to invite fine guest musicians, if such was Prince Nikolaus’ wish, which was usually the case. Mozart, who became Haydn’s protégé, was undoubtedly the most remarkable musician ever to perform at Esterháza. Finally, distinguished visitors flocked to Esterháza and, every year, Haydn spent up to two months in Vienna, the city that was home to Mozart and would soon be home to Beethoven, who would be Haydn’s student, albeit briefly. I will pause at this point and post a second article focussing on another member of the Esterházy family, Ferdinand Walsin Esterhazy, the man who sold information to Germany, a crime imputed to Alfred Dreyfus, a French artillery officer of Jewish background. The Dreyfus Affair would divide France into Dreyfusards and anti-Dreyfusards and reveal considerable contempt against Jews, particularly in the military. [i] Narrowly speaking, the Classical period extends from (1730–1820). It follows the Baroque period (1600–1760) and is followed by the Romantic period (1815–1910). These periods overlap. [ii] “Joseph Haydn”. Encyclopædia Britannica. Encyclopædia Britannica Online. Encyclopædia Britannica Inc., 2013. Web. 12 Mar. 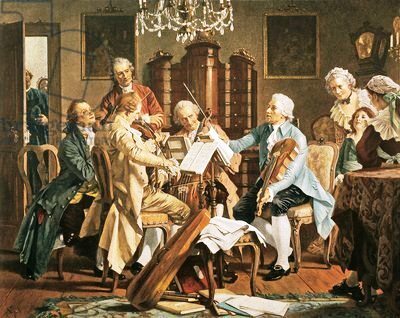 2013 <http://www.britannica.com/EBchecked/topic/257714/Joseph-Haydn>.